I've been wanting to do some freezer cooking here lately and have been pouring over my Pinterest boards. I have a ton of ideas pinned - but couldn't get my brained focused enough to print out all the recipes that I wanted to make and make a grocery list. It hit me to just pull everything out of the pantry and freezer just to see what I had. I had two bags of frozen chicken breasts, 2 lbs of ground chicken, a 1 1/2 lbs of ground beef, stew meat and plenty of cans of diced tomatoes. I did go buy the green bell peppers and carrots - but everything else I had. It's amazing to me some of the things I found at the bottom of my freezer...some Rotisserie Chicken, the Kraft Fresh Take cheese mixes and a lot of shredded cheese! I felt like a chef on "Chopped" or "Iron Chef", I kind of looked over everything and wrote a list of things that I would have all the ingredients to make. First, I cooked all the meat that I needed. I floured the stew meat and started browning it for the Amish Stew. I threw the 2 lbs of ground chicken and the 1/2 lb of ground beef in a dutch oven to start cooking for the lasagna and sloppy joes. Next, it was time to slice all the veggies. I knew I needed all three of my green bell peppers sliced for the stir fry. I also tried to be fancy and cut some of the carrots for the stir fry into logs. It resulted in a cut finger. I didn't have any onion on me, so for all my recipes that needed it - I used dried onion. It's super cheap and easy. I also didn't have any garlic, so used garlic powder instead. The Amish Stew's already to go! The stir fry's were so easy! I also had a half bag of frozen green beans that I divided between the bags. You won't need to defrost these all the way. and heat them until the veggies are done. Serve over rice...buy a few egg rolls and your meal is complete! The chicken stir fry was the exact same....except I used chicken. If you let your chicken defrost just a little on the counter top, they are super easy to slice into strips. I thought I was going to make a full on lasagna. only had five noodles in it. Crushed the noodles in the bag. 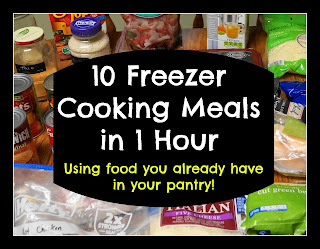 Throw everything in a freezer safe bag. When you cook this lasagna....put it into a casserole dish and top with the remaining cheese. Cover it with foil and bake at 350 for about 35 minutes. The Italian Smothered Chicken was not on my original list. But I ended up having more chicken then I thought. Uncover and bake until cheese in completely melted. This is an easy one....grilled chicken. We also seem to have last minute friends that either come over or invite us over to cook-out. It's always BYOM (Bring your own Meat) so this is something that we can grab out of the freezer and go. Last was the Sloppy Joe's. I put the rest of the ground chicken/beef mixture in the bag and poured the can of sloppy joe mix in. I'm not a fan of sloppy joe sandwiches...but the kids and the hubby love them. I do like them in bowls, something you might want to try too. 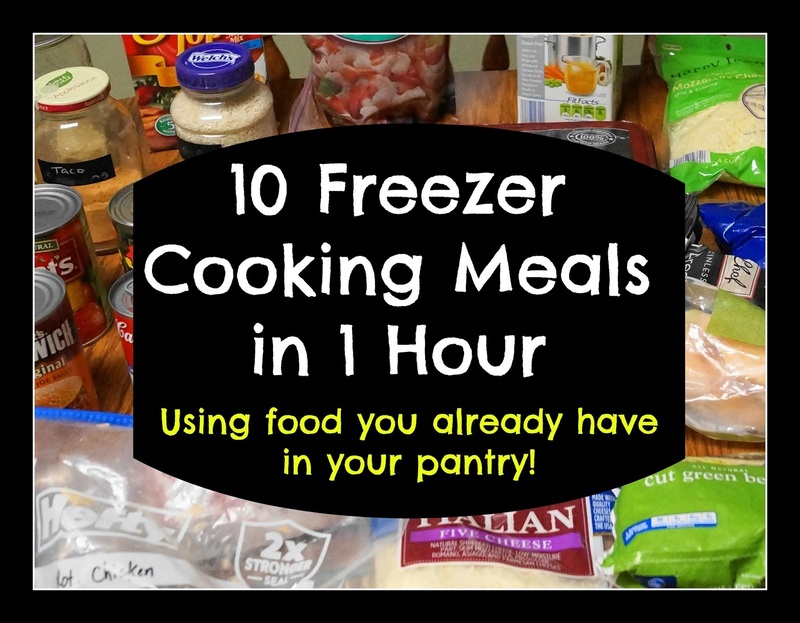 I got 10 freezer meals using what I had in my pantry!! The best part is that it took me under an hour! Freezer cooking does not have to be complicated or involve big recipes. Use your imagination and come up with some great ideas for your family! Divide it all between two freezer safe bags. When it comes time to cook this, you'll add 3 diced potatoes at the bottom of your crock-pot, and throw everything in the bag on top of them. Cook at low for 6-8 hours. Great ideas! I should totally do this sometime and you made it look so easy! Thanks so much for stopping by! It was alot easier because I did it after the kids went to bed! Haha! That would make it a million times easier!! Thanks Linda! I did link up to your party! I would love to be able to do this sometime and have meals "in the bag" so to speak! Thanks for the tutorial! Thanks Emily! Glad you stopped by! Thanks Sarah...in a house full of boys Ironman bandaids are a must! Do you have the recipes for all of these written out? I would love to just be able to look and follow them! I've been looking for ideas for a long while! I LOVE you! No, really...I do! Thank you so very much for your blog posting for these meals! Huge help for me! Hope you are having a beautiful weekend!